Claremont Lincoln University is committed to positive social change through its capstone program. 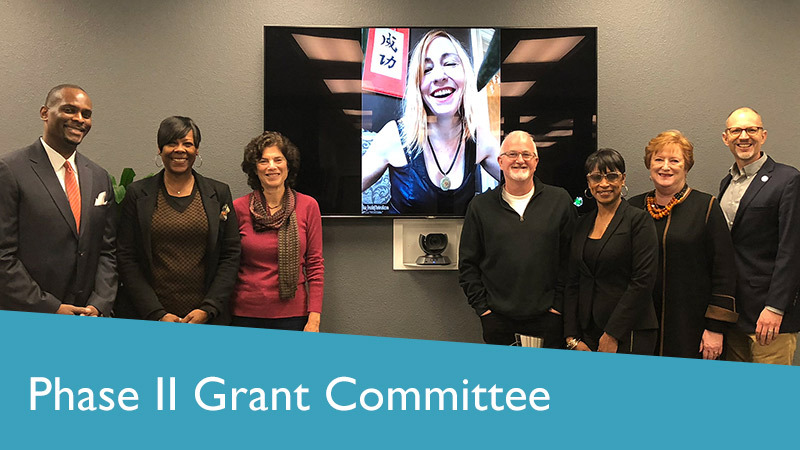 As another example of this commitment, Claremont Lincoln University hosted its first Phase II Grant committee meeting on Tuesday, February 27. The purpose of the grant committee was to review applications for the Center for Action Research’s first ever Phase II grant award. CLU alumni who had completed their capstones were invited to apply for a grant that would help fund a second iteration of their project, with the goal of expanding the project’s impact. The grants were made possible by UPS, who generously provided $10,000 for the purposes of supporting student capstone projects. The Phase II committee distributed the money in the form of two $5,000 micro-grants. Our committee was comprised of both long-time friends of CLU and new contributors who brought a wealth of wisdom to the committee meeting. Robert Egger – Founder of L.A. Kitchen with over 30 years’ experience in non-profit leadership and positive change related to food needs. LaShawn Stanford – Human Resources and Community Relations manager with 20 years’ experience at UPS. Ruth Wolman – Developmental psychologist and philanthropist. Lisa Lincoln – Niece of founder David Lincoln and benefactor of CLU’s Sunrise Humanitarian Scholarship. The committee reviewed seven grant applications from alumni. These applications ranged from individual projects in rural communities to urban projects partnering at the national level. Each committee member chose their top three applications, and then the group looked for the two that got the most votes. The committee chose two projects, after becoming particularly impressed that those projects demonstrated the greatest potential for both sustainability and large-scale impact. They were impressed with all the projects applicants concerns for positive social change and recognized needs in both rural and urban settings. The two winners were Ely Flores (Master of Social Impact, 2016) and Lydia Aranda (Master of Social Impact, 2017). Ely Flores commented, “This is a great opportunity to offer our students a platform for peer support and at the same time helping them complete goals – graduating high school, college, and becoming community leaders.” His current work includes developing a program for 16-24 year olds struggling to finish school. By partnering with Youthbuild USA, Ely is developing home groups that provide space for young people to empower both themselves and each other while together overcoming the hurdles of completing their education. After being notified that her program received a grant, Lydia Aranda replied, “I am thrilled and delighted to be a recipient of this inaugural Phase II Capstone Grant by UPS and CLU!” Her project focused on mentoring and professional development for young women through both local and national events. She went on to comment, “The UPS-CLU alliance is a wonderful example of leadership in collaborative change — the grants awarded to our capstone projects represent more than money, bringing credibility, support systems and a sense of partnering. This is real investment in our purposeful, forward-moving. positive social change solutions, and a testament to the difference we as ‘action research practitioners’ can make in the world… today, for tomorrow.” Those who wish to know more about CLU’s Capstone model are invited to see the Center for Action Research and our library of example projects. Is this grant still available? I would love to apply. I have many ideas for potential projects I could complete which benefit both my community and my collaborative’s social impact on the kindergarten readiness of the 0-5 population in Oberlin, Ohio. I will be completing my last term in June 2018. Thank you for your post, Jennifer! We have awarded our grant for this year. However, we are working to continue our Phase II program, so that you can apply for future grant opportunities. We will continue to communicate with students and alumni as our Phase II program develops. Thank you. I would be interested for next cycle since I do not graduate until June 2018. I look forward to learning more when the time comes! Definitely, Jennifer. I will send an announcement to all of CLU’s alum when the next grant opportunity materializes. This is an exciting opportunity for both CLU and our alumni, and I look forward watching our grant program develop in the coming years.